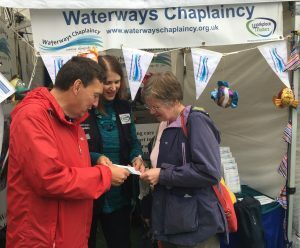 The Greenbelt Festival over the August Bank Holiday weekend (24-27) saw a Waterways Chaplaincy presence among the huge range of colourful tents and stands in the grounds of Boughton House. This Northamptonshire stately home was hosting the long established and hugely popular fully ecumenical arts and music festival for the first time. The Waterways Chaplaincy presence there reflects the broad churchmanship of this burgeoning ministry which currently sees 70-plus chaplains offering pastoral and practical support for the thousands of people who live on and around Britain’s rivers and canals. Senior Chaplain in the South of England, the Revd Mark Chester, was there with his North of England Colleague, Debbie Nouwen, and chaplains Zillah Chester, Richard Alford, Richard & Frances Skinner and John & Gillian Speight, manning an attractive new stand with roll-up banners. Although Greenbelt is a festival with deep Christian roots, many attendees are not necessarily believers in any conventional sense, but they are there alongside very committed Christians of many traditions many of whom would be ideally gifted to be Waterways Chaplains. ‘We had some very positive responses,’ says Mark. ‘…probably over 100 significant conversations, some of which may lead to new volunteers and advocates for what we are doing as a chaplaincy. Waterways Chaplains all over the country, or themselves cruising in their own narrowboats, have been busy throughout the summer. However, as autumn approaches fast there will be new challenges for vulnerable boaters especially those who are new to living aboard, and the Chaplaincy expects to be busy in its ministry of being ‘pastorally proactive and spiritually reactive’.